Considering St. Augustine grass? Think again…. 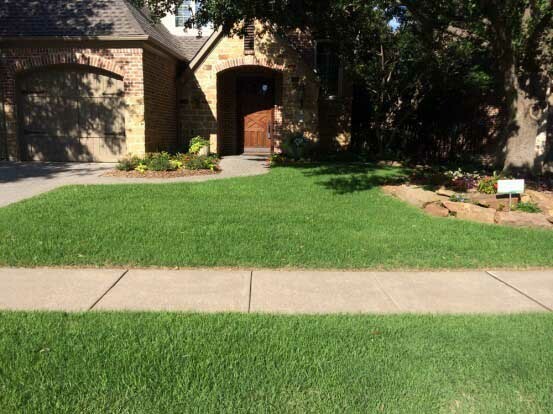 Although St. Augustine is a very popular turf variety, it may not be the best choice here in North Texas. Keep reading to find out why! For years St. Augustine has been a highly suggested turf variety by professionals in our industry. It is known for its shade tolerance and if healthy, its ability to choke out invasive weeds. When St. Augustine is planted via plugs and in the right growing conditions, it can fill in to near completion in just one growing season. Its leaf blades range from deep to lighter green and its appearance is thick and lush. It seems like there is a lot to love about this turf variety so, is it really all it’s cracked up to be or are we living in the past? While St. Augustine is not native to Texas, we have been propagating and planting it here since the 1920’s starting with the Texas Common variety. In the early 1970’s, Florida Texas A&M designed a St. Augustine variety called Floratam that was supposedly SAD (St. Augustine Decline) and chinch bug resistant. 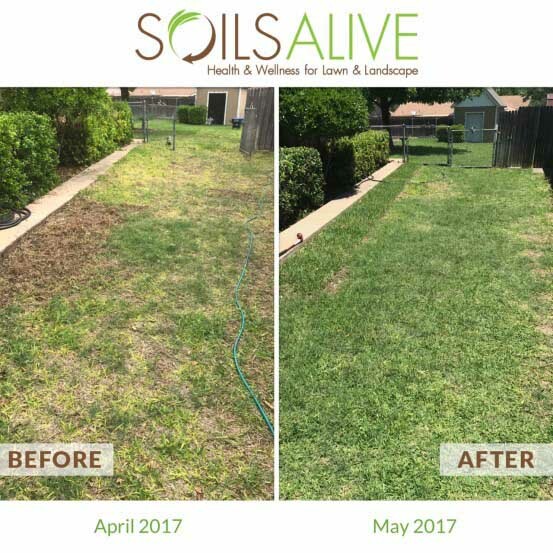 This was very appealing because SAD and chinch bugs can cause rapid devastation in lawns and as you may know, replacing your lawn is not cheap and is quite troublesome. In the 1980’s, Floratam was brought to Texas and was planted in mass amounts in the up and coming North Dallas area. Landscapers and turf businesses soon realized that planting Floratam here was disastrous.This variety was somewhat suitable for the coastal parts of Texas due to its milder climate but was not well suited for North Texas because of it’s lack of cold tolerance. Also considering that Floratam required 2 + more hours of sunlight than the Texas Common variety, it soon became apparent that it was not working as well in shaded areas. Fast forward 30 years. Since Floratam has been out of the picture, Raleigh and Palmetto St. Augustine grass are on the main stage in North Texas. Raleigh is not known to be chinch bug resistant nor is it as cold tolerant as Palmetto. Therefore, Palmetto is the most recommended here in North Texas. Another attribute of Palmetto is its deep setting root system. Once established, this is beneficial in times of drought and water restrictions. So what is really SO bad about St. Augustine? Since the mid 2000’s we have been seeing a steady decline in St. Augustine’s performance. We believe that the adaption of insects and diseases to pesticides has played a key role in the decline in St. Augustine along with the 2nd worse fungal issue in our industry- Take All Root Rot (TARR). TARR is absolutely devastating to St. Augustine lawns. While it can affect other turfgrasses, St. Augustine is hit the hardest, by and large. Since TARR cannot be eradicated from the soil, it has to be controlled. Industry wide it is recommended to apply pete moss in conjunction with a fungicide to combat this disease. We have found that approach to be ineffective and over the years we have perfected a completely organic “kitchen sink” protocol to control TARR. While TARR is the most prevalent disease affecting St. Augustine now, there are many others: Chinch bugs, Rhizoctonia aka Brown Patch, SAD, and Grey Leaf spot to name a few. What turf variety do we recommend? Zoysia has many great qualities. One being its unlikeliness to be affected by most pest and diseases. Please know that it can contract diseases although it is not nearly as susceptible as St. Augustine. There are quite a few different varieties of Zoysia and on average it requires about 5 hours of direct sunlight. If looking to plant Zoysia in shade, we recommend one of the thicker bladed varieties like Palisade. As a friendly reminder, this is just our opinion. Some of you may think that St. Augustine is the 8th wonder of the world and if so, stick with it! Everyone has an opinion and preference when it comes to their landscape. Do what makes you happy! And don’t forget … there is no turf that will thrive in dense shade. If you are looking to grow turf in an area that gets little to no sunlight, it is recommended to modify your landscape to accommodate that environment. Otherwise you are fighting a very expensive losing battle.